Home Mexico and Latin America	Chavez: Sinner, Saint, or Sacrifice? 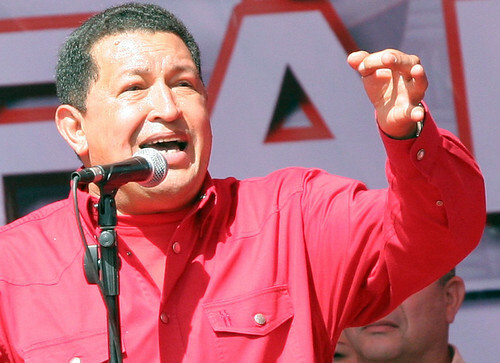 When official news broke that Venezuelan President Hugo Chavez had passed away of cancer on March 5, 2013, it was met worldwide with mixed responses from civilians, political leaders, allies, and enemies. A polarizing figure, Chavez certainly altered the South American political landscape during his fourteen years of democratically elected rule – elections which were legitimated by international monitoring – periodically giving himself, and Venezuela, international media attention. Yet whatever title you give Chavez – would-be dictator, autocrat, socialist, president, savior – his death undeniably sparked remarkable and unyielding reactions. Across the globe, responses to his death included unadulterated bereavement in the streets and city centers of Venezuela by his ardent civilian supporters; eloquent proclamations, peppered with elegiac strains, by Latin American leaders about Chavez’s indomitable spirit; U.S. politicians’ equivocated, yet diplomatic, official responses; and celebrations, flag-waving, and cries of joy by Venezuelan expatriates rejoicing, either for Chavez’s death or the new era that the event ushers. For a country with such strong familial ties around the world, the reception of the news itself has elicited a span of emotional responses. But it is this concept of “news,” and how the media portray non-U.S. leaders, and possibly non-U.S. sentiments, that undoubtedly contributes to the range of reactions erupting in the wake of Chavez’s passing. Understandably, the media are incredibly powerful and have the capacity to bias the perspectives of their viewers, listeners, and readers. That the media are subjective is not a new philosophy, and neither is the knowledge that their subjectivity is, at least partially, based upon the leanings, proclivities, and, of course, monetary influences of media stakeholders. So when processing Chavez’s death and the inevitable ensuing portrayal of his legacy, it may be prudent to first reflect upon how the messages received by those outside Venezuela have been crafted, delivered, and adjusted according to their audience. Is it simply because that as Venezuela’s poverty levels severely decreased under Chavez’s rule that the leaders of other nations teetering on the brink of the arbitrary classification of “developed/developing nation,” such as Cuba, Bolivia, and Argentina, severely mourned his death and praised his spirit? Chavez, who was democratically elected in 1999, undeniably centralized and internalized the power beyond that which his office granted him after his survival of 2002’s coup d’état; was it because of this internalization that the heads of countries with either a past or current relationship with a form of government that excludes democracy, such as China, Iran, and Russia, praised that very power-centralization for the benefit of Venezuela, as a whole? And is it because Venezuelan-United States relations became strained, possibly sour, during Chavez’s tenure that President Obama’s official response exuded almost painfully neutral diplomacy and desire for a more harmonious relationship in the future, even while former President Carter lauded Chavez’s aggressive assertion of South American governments? Or does media bias somehow have to be accounted for? Obviously, editors have final say in what news is presented and where in a specific broadcast. But absolutely everything that is disseminated by the media (print, online, and over the radio and television airwaves), in relation to how the news should be presented, at what reading level the stories should be written, and how much time should be allowed for each piece, all plays into the opinions formed by those ingesting a specific story. Considering that every single media outlet in the U.S. is owned by one of only six conglomerates (seven if you include Clear Channel), the heads of which all have personal, political, and social viewpoints that inevitably trickle into the decisions made about the conglomerate’s welfare, one must ingest said media with the proverbial grain of salt. This is not specific to the U.S. either, but a worldwide approach to media ownership and facilitation. They don’t call it “programming” for nothing. Whatever your personal interpretation of Chavez may be – defender of freedom, chauvinist, victim of conspiracy, victim of a vengeful God, Godsend, demon of democracy – his concentration of power is not unlike the concentration of power demonstrated by the media conglomerates bringing you the stories on his exploits (or centralization of government, or socially conservative gender beliefs, or what have you). And whether for good or bad, Chavez, over his fourteen-year rule, has left an indelible mark on the history of Venezuela, South America, and the rest of the world. How Venezuela’s connection with the U.S. (and the myriad other nations of the world with which the former has a relationship) will now develop is something that only time, and the media, can tell. Kara McManus recently completed her MEd in Higher Education Administration from University of Hawaiʻi atMānoa. She also has a BA in Communication Studies from the University of Oregon and an MA in English from Clemson University. She currently lives in Honolulu, Hawaiʻi. I intended to compose you one little bit of remark to finally say thank you as before for your personal stunning principles you’ve featured on this site. It was certainly tremendously open-handed with you giving without restraint precisely what numerous people would have offered for sale for an ebook to end up making some bucks for their own end, even more so considering that you might well have done it if you wanted. The ideas likewise worked to become a great way to be aware that someone else have the identical keenness much like mine to find out much more pertaining to this matter. I know there are numerous more fun moments up front for people who read your blog post.